The Archive very few copies both books so please contact the Archivist for details. This is the first full study of the history of the Erasmus Smith Trust. 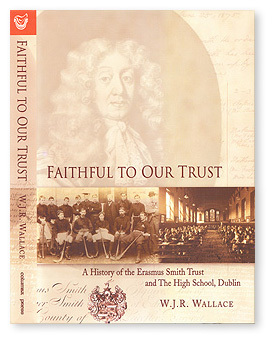 The Trust was established in the seventeenth century by Erasmus Smith, a London merchant who had acquired a very large estate in Ireland during the Cromwellian Plantation, part of which he gave to support schools in Ireland. A Royal Charter was issued in 1669. It provided for the setting up of three Grammar Schools: at Tipperary, Drogheda and Galway. Later, a fourth was founded at Ennis and in the nineteenth century the Trust supported over two hundred primary schools spread over most of Ireland. In addition, the Trust was a generous benefactor of Trinity College, Dublin and the Blue Coat School (King’s Hospital). The history of the Trust casts a fascinating light on the history of the Protestant community in Ireland over a period of three hundred years. In the late nineteenth and early twentieth centuries its history was controversial, as the Protestant control of its resources was challenged, culminating in a legal action by which that challenge was partially successful. The High School was the last of the schools to be founded and is today the only school run by the Trust. This book traces in detail the first hundred years of the School, examining the changing social and political circumstances in which it operated and their effect on its development. Some of the characters who enlivened its story, including W. B. Yeats as a schoolboy, are described. The book ends with the amalgamation with the Diocesan School for Girls. Ronnie Wallace taught History and English at The High School until his retirement in 1996. A short film was made in 1971 prior and during to the move of the High School, Dublin from Harcourt Street to ‘Danum’ in Rathgar. 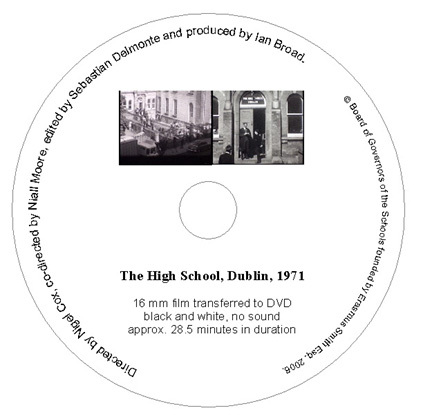 The silent 16mm film follows a day in the school with students arriving, assembly, various classes, recreation, staff, detention, and the opening ceremonies at ‘Danum’ presided over by Jack Lynch, the Taoiseach. The film was directed by Nigel Cox, co-directed by Niall Moore, edited by Sebastian Delmonte and produced by Ian Broad. The film has been transferred to DVD and is now available for sale at €30 per copy. Contact the Archivist for ordering details.